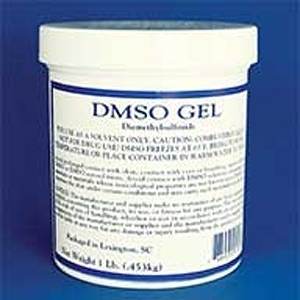 DMSO (Dimethyl Sulfoxide) Gel is to be used as a solvent only. DMSO is a colorless liquid derived from lignin, the natural material that bonds together the cells of trees. It is extracted during the manufacturing of pulp and then processed. It is an organic non-synthesized product. 4 oz. From Solvent Sales, Inc.